An amazing video by Russian space agency Roscosmos shows the horizon with some celestial bodies like black holes very much closer to earth than they really are – and it’s wonderful and eerie. The animation demonstrates several galaxies and nebulas, and even a black hole and a supernova star as if they could be seen in the night skies above our heads. The video is not a scientific simulation – a black hole or a supernova exploding star couldn’t exist in such proximity of the Earth, or rather vice versa – but a splendid illustration of what celestial bodies look like, as documented by telescopes like Hubble. 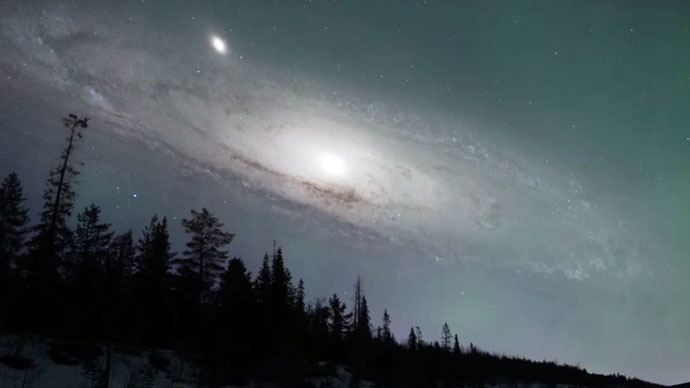 Among the celestial bodies in the video, are, for instance, the Whirlpool Galaxy, which is 30 million light years from Earth, and the Andromeda Galaxy, about 2.5 million light years from Earth. The footage followed another video, showing how our horizon would look like if other Solar System planets were at the distance of the Moon.